I’d like to start by saying that Morris is a beautiful writer. The way he can capture a theme or a feeling will make you feel like you are riding shotgun in each character’s tormented lizard brain. That being said, the story felt very derivative. Not that derivative is always bad, it was just a little too on the nose. It felt almost like a mix between Stephen King’s The Shining and Sartre’s No Exit. It’s one of those novels that you start reading and immediately think you know how it is going to end. The good news is he surprises you with the ending, the bad is that he takes a little too long to get you there. Morris can do creepy and do it extremely well. There was all sorts of creepy in the novel, especially in the beginning when the table is being set for the main course. It’s been a long time since a book actually got my heart beating fast while reading it. I distinctly remember at one point putting the book down at around 2 AM, taking a leak then literally running back to the safety of my bed, Morris’ phantoms giving chase an inch behind. It’s the kind of creepy that gets under your skin and stays there like a spider bite. One of the reasons the creepiness is so effective is that he captures the essence of dreams so fluidly that it feels like a dream that you might have had and somehow shared with the author. The novel is a little disjointed, certainly incomplete but it hits the primal high notes of fear and confusion in a relentless avalanche of icy chill that leaves you deliciously wanting. The book kicks off with our small family of a mom, dad, son and fucked up druggy brother to dad that end up pulling off the highway and into a small town due to a raging blizzard. 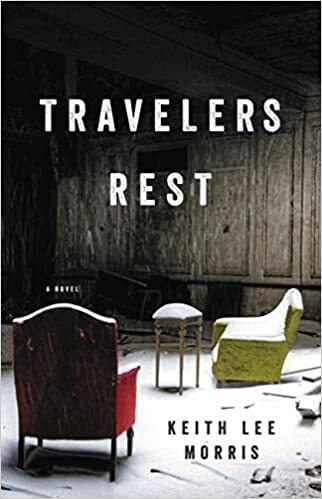 They end up at the Traveler’s Rest, a gorgeous old hotel that is clearly out of place in a town that had its hey day many decades before. The hotel belongs to the past, or the past belongs to it but either way it is a place out of time. They check in as the storm continues to rage and that’s when the mayhem begins. All four characters end up getting separated and quickly tossed into some level of existential frustration that makes up the rest of the book. The mom and the dad get it the worst. They get put on the dream treadmill and neither seem able or willing to get off. Their disappointments with how their lives ended up become fodder to the dream factory that ultimately traps them in a constant rerun. What appear to be strengths of each character are quickly turned to weaknesses and what these characters believed to be important can’t make it past the snow imposed malaise that continues to pile on the consciousness of these tormented few. It’s a study of the human condition but not a happy one. Morris gives you the data and seems unconcerned with how you will take it. My only real criticism is that the middle of the book drags a bit as our author seems to get a little too impressed with the dream land he has created and selfishly wants to extend it long after making his point. Other than that though, it is a quality read that kept me thinking about it long after I finished the book. It’s worth your while.